You can't always be at the top your game, and Apple is no exception. As we eagerly await today's WWDC reveals, it's fun to remember that for every hit there's a handful of slightly more questionable ideas that just never quite clicked. Here are the seven of weirdest Apple gadgets that just weren't good enough to make it to the finish line. This prototype (obviously) wasn't called the "Surface" but instead, "Bashful." An earlier prototype of the Newton, which did eventually make it to market, Bashful would have come with a keyboard and stylus if it ever made off the drawing board. Like the Bashful, this dual-screen setup was another idea being kicked around in the early 80s. Also like the Bashful, it was designed by Hartmut Esslinger, founder of Frogdesign. One of the many prototypes unearthed during Apple and Samsung's epic patent row, this octagonal iPhone could have been the shape of phones-to-come until Apple opted for that oft-imitated "rectangle with rounded corners." 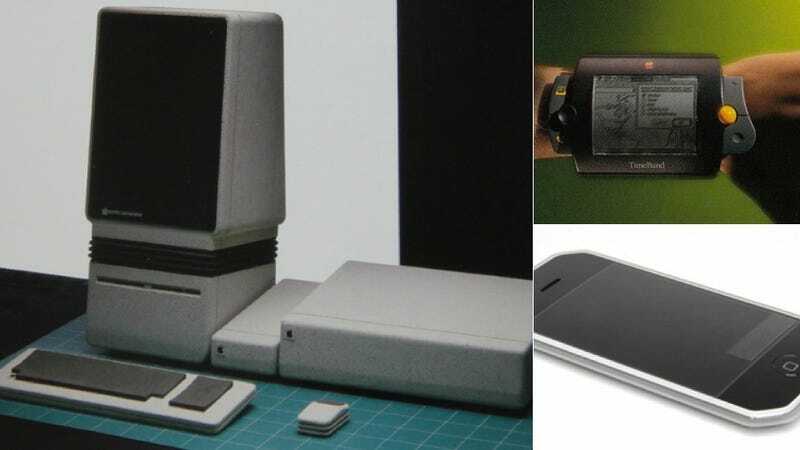 Pre-cursor to both the iPhone and the iPad, the Apple Snow White 1 Tablet Mac and the Apple Snow White 3 Macphone (left and right), were in development in '82 and '84. But instead of pushing the weird tablet-phones out to market, Apple turned to the Macintosh, and waited a few decades before coming back. Another gem from the Apple vs Samsung lawsuit, this prototype is was labled N90, so chances are it's an iPhone 4 that never was. An Apple watch isn't a new idea; the Time Band dates back to 1991, when it was published in the Japanese magazine Axis. The image was published as a mere concept that then-CEO John Sculley was touting, so chances are the abomination was never actually prototyped. Another Esslinger joint, this setup was entitled "concept 2" and was intended to represent americana, drawing inspiration from things like Studebaker to the Coke bottle. But perhaps most striking is its wildly vertical screen.